Halloween is literally right around me the corner. You know that means: CANDY! If you missed it, I put together this Guide to Dietary-Restriction Friendly Candy. These lists include gluten-, dairy-, and/or soy-free options. While perusing the Halloween candy section at Target, we discovered a various bags of candy that meet all of the above requirements. I was also shopping on Vitacost when I decided to check their coupons. They had a sale on Halloween candy, so who could pass that up? Being the dutiful blogger that I am, I have done some research for you. You’re welcome. ? Sadly, Vitacost removed some the candy that Nikki selected (probably because it became unavailable since we waited overnight to place the order). We still got some good selections to test for you. All of the candy is gluten-, soy-, & dairy-free. 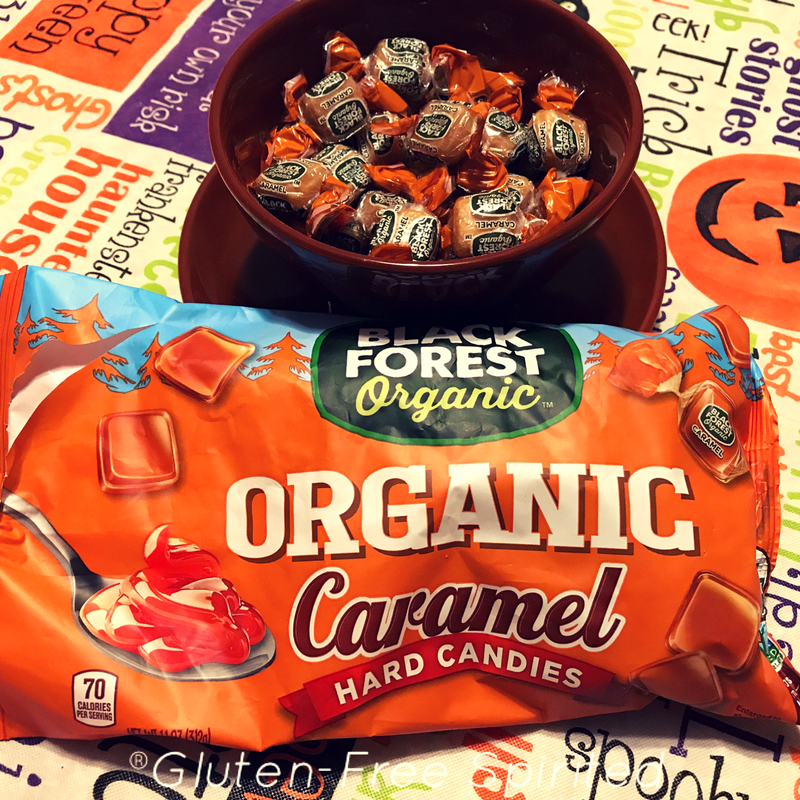 –Black Forest Organic Caramel Hard Candies: These square candies taste just like other caramels (not *just* like Werther’s, but a good alternative). GFS approves. 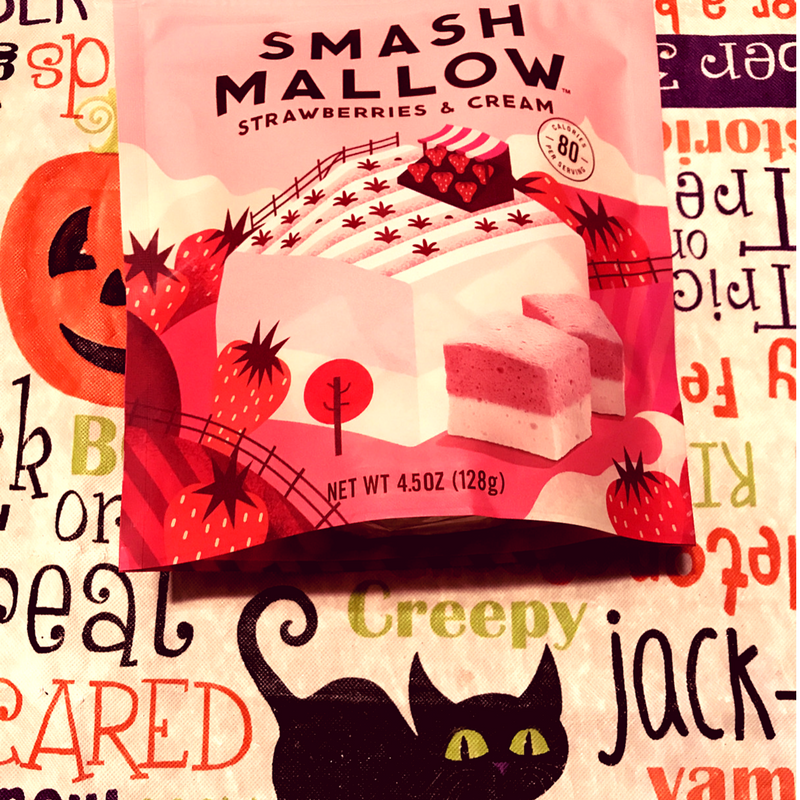 –SmashMallow: They bill themselves as “America’s snackable marshmallow, made from only the best all-natural ingredients.” They have several flavors to choose from; Nikki selected Strawberries & Creme. Its not soft like a typical marshmallow. It’s firm, but chewy. Sometimes the flavors do not match what they’re supposed to be. In this case, it tastes exactly like it says. GFS approved (this is Nikki’s favorite & she doesn’t want to share). This is Nikki’s favorite of the candy we researched. 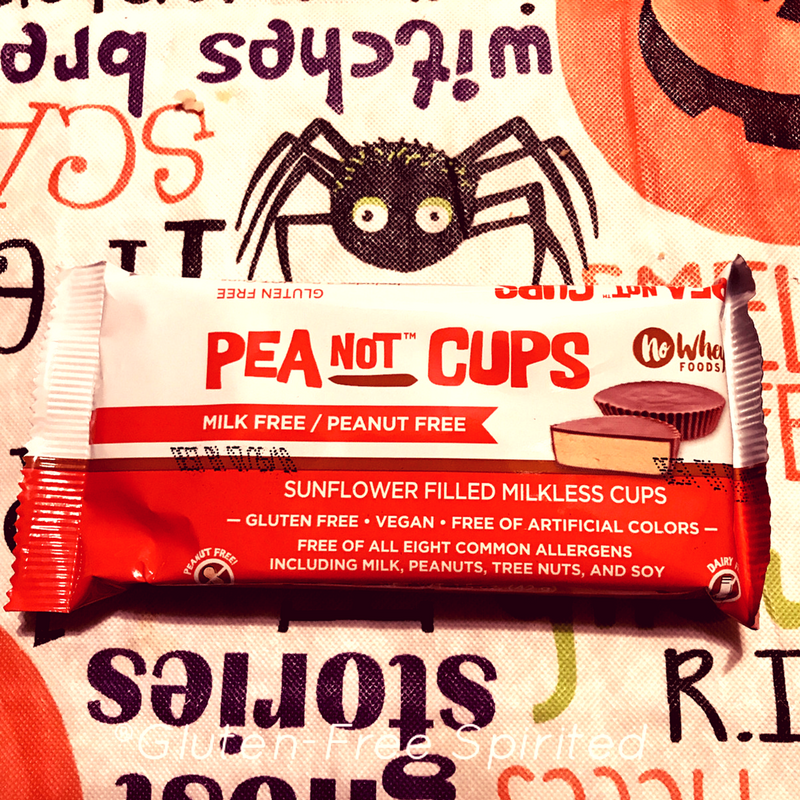 –Pea Not Cups: Can’t eat Reese’s Peanut Butter Cups? This may be another option for you. This milk-less/peanut-less version is made with sunflower butter. It’s also free from the 8 common allergens. If you’ve had sunflower butter before, the taste will not be a shock to your taste buds. If you’ve never had it, it’ll be a bit of a surprise. This may not be for everyone, but GFS approves. Despite it’s name, there is no pea protein in it. 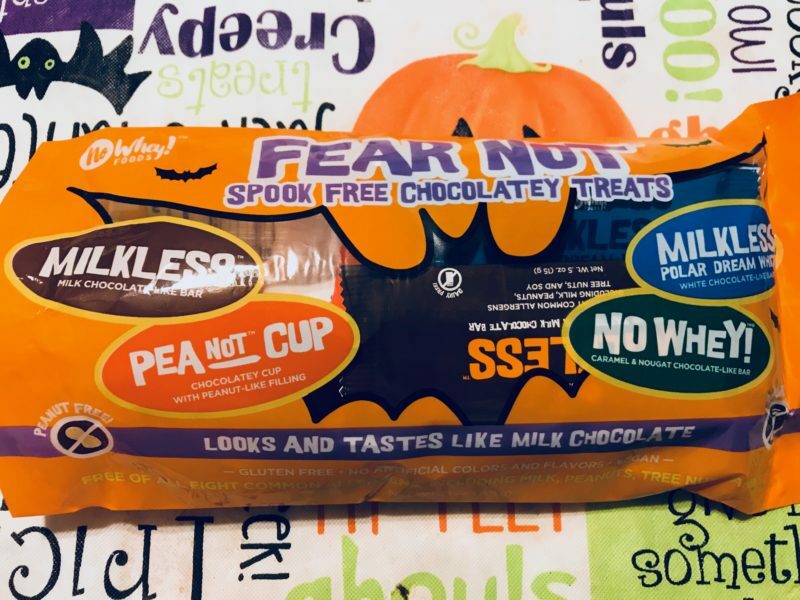 No Whey Chocolate has a bag of individually wrapped Spook Free Chocolatey Treats that includes the aforementioned Pea “Not” Cups, No Whey Candy Bars, Milkless Chocolate Bars, and Milkless White Polar Bar. 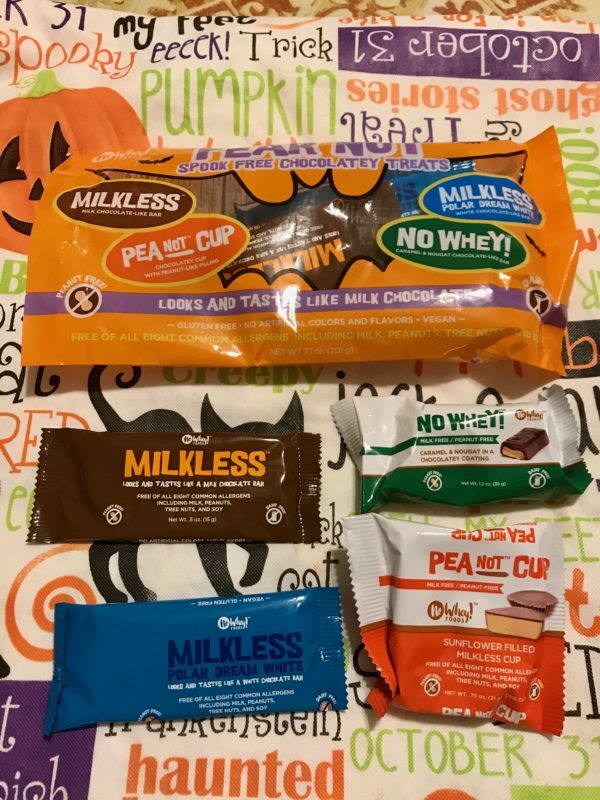 We like all four candies, but Nikki’s favorite is the Milkess White Polar Bar and the No Whey Candy Bars because they’re similar to her favorites. 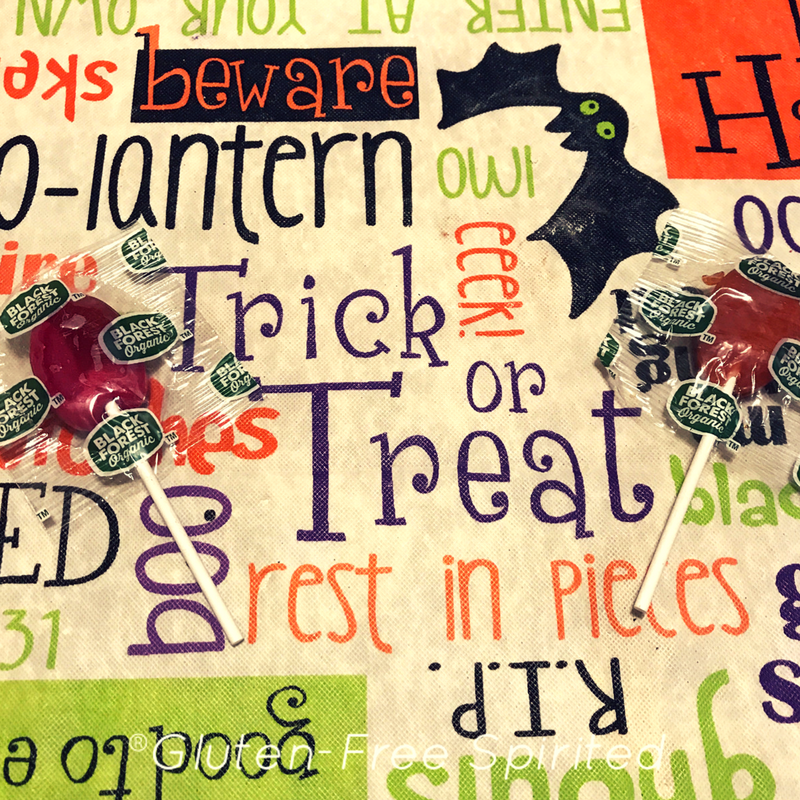 You can’t go wrong with any of these candies. These are definitely Spook Free! This festive lollipops are pretty big. It’s white chocolate and free of the top 8 allergens. GFS approved. Pro tip: try to be home when you package is delivered, otherwise it’ll sit on a hot mail truck all day & this happens. –Black Forest Organic Lollipops: There are four flavors: Cherry Apple, Strawberry Lemon, Orange Mango, & Melon Berry. I had the Orange Mango & it’s very good. Nikki had the Melon Berry. They have a lot of flavor & are GFS approved. 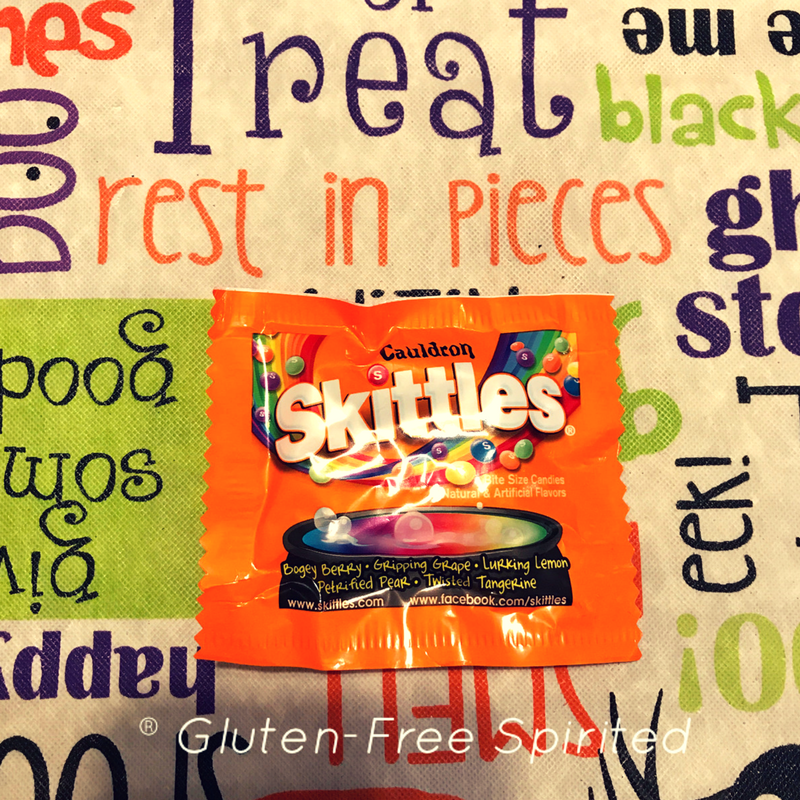 –Skittles: The Halloween version is named Cauldron Skittles. It has a mix of original flavors as well as tropical flavors, however they’ve been given holiday names: Petrified Pear, Gripping Grape, Twisted Tangerine, Boogey Berry, and Lurking Lemon. Skittles are a GFS favorite and we approve of these. A classic with a little twist. There you have it! Let me know in the comments what your favorite Halloween candy is. If you liked this review, you might also like reviews of Easter candy and No Whey Chocolate. Get social with GFS with the buttons below and don’t forget to subscribe so you don’t miss new blogs! It’s so great to see companies that make options to include everyone. It’s not something you really even think about it unless you know someone or it’s brought to your attention. You’ve just reminded to put my treats in something interesting. I knew Halloween was around the corner but hadn’t prepared. I’m always caught off-guard although I love giving those kids something to take home. Halloween is sneaking up on me too! Great list you shared here! Good to know we can enjoy sweet treats the healthy way. 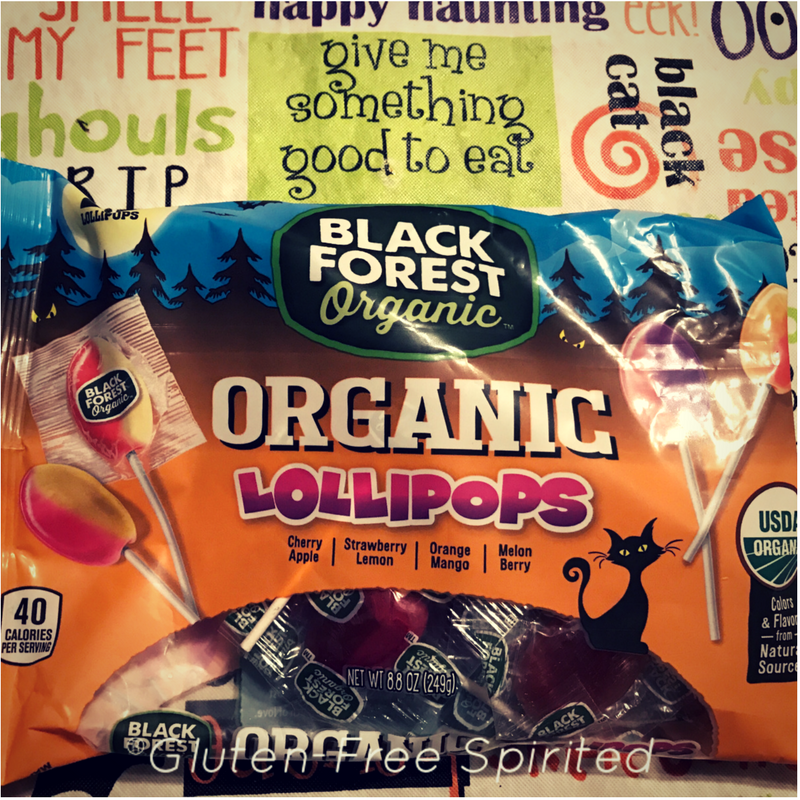 Black Forest Organic Lollipops are my favorite especially the orange mango flavor.also it is gluten free and soy free which is good health prospective. I had never had them before & couldn’t believe how good they were! I really like the orange mango too. Great post. I can’t have gluten so this post really speaks to me as well to help me know that I have options for yummy candy too! 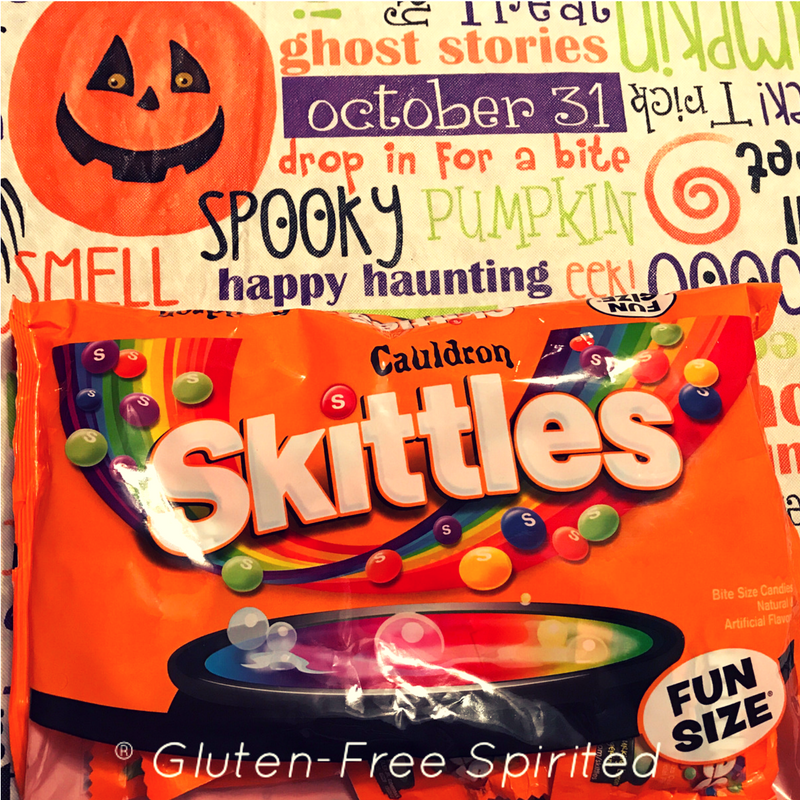 I didn’t know skittles were gluten free, we don’t normally hand out candy at halloween, instead we take our children, 2 for each parent. But it is great to see tha more companies are seeing the need to cater to other dietary needs. I was surprised that Skittles were gluten-free (and soy-free) as well. We’re going to pass out non-food items as well for those that either don’t want candy or prefer for their children not to have sugar. You are giving me wonderful ideas for our Halloween party this weekend and i have to host one for my kids and friends. I’m so glad to hear that, Pooja! I hope you have a great party! I usually avoid Halloween candy due to all my dietary restrictions. Loving these healthier alternatives. It’s so great to see so many options and I was surprised that Skittles were one that many can eat. I don’t really eat candy but I am glad there are so many alternatives for the little ones. I think the ‘pea-not cups’ are hilarious and a very smart idea for those with peanut allergies and have to miss out on chocolately treats! It’s nice to see all these alternatives for kids with allergies. I think Pea-Not-Cups is a brilliant name! I know skittles are not kosher, but do you happen to know if any of these other candies are? We don’t observe Halloween, but I definitely observe November 1st! “National discount chocolate day” lol Thanks in advance! We check the ingredients on the back to see if they contain gluten, dairy, and soy. 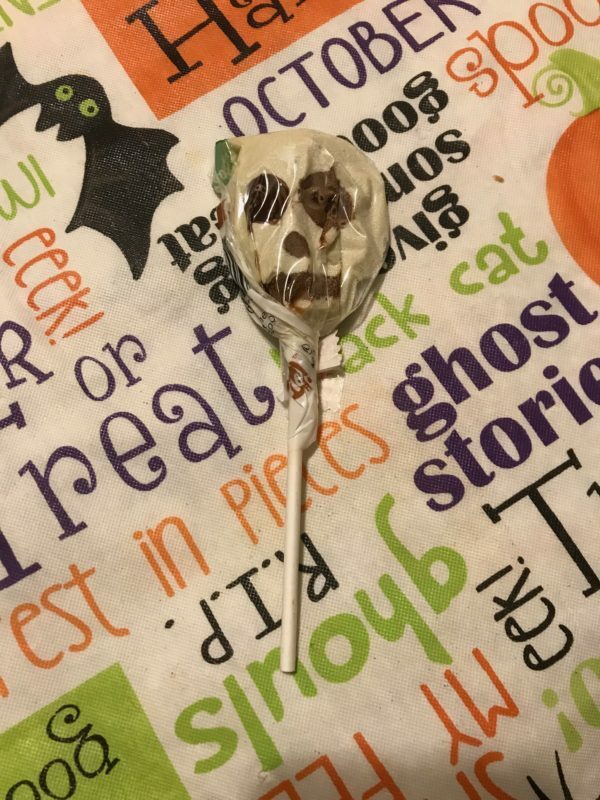 I also put together a guide to Halloween candy a few weeks ago that includes lists that other bloggers/websites put together about candy that is safe for those with specific allergies. LOL November 1st should be a holiday too! Caramel Candies are my FAVORITE! Something about them always reminds me of Fall as a child in Florida eating them with my mom! Have you ever tried UnReal candies? Those are one of our faves, I think some of them are Gluten Free, but I know their Peanut Butter cups are Vegan! The caramels are really good! I had never heard of Unreal until this week when I saw an email about them from Thrive Market. I’ll definitely look into them & might have to get some with my next order. Thanks for the suggestion! These are some great options for Halloween. We have been seeing a decline in our trick or treated as many people are doing the trunk or treats now. We’ve had a really sharp decline in our neighborhood as well. It’s kind of sad to see. Thank you for the overview. Honestly, I didn’t even know they were available in the market. You’re welcome. I was surprised by the number of options. My kids are a huge fan of skittles. and that organic lollipop looks interesting. I will definitely check this out. The organic lollipops were really good! I was pleasantly surprised. Thats a great review girl. In India there is not much Halloween Celebration but I am happy in other countries it’s celebrated in a big way.. Thanks! It’s a fun holiday to participate in. I want to try the caramels! I love anything with caramel in it and those sound really delicious! It’s nice that there are candy options for kids with dietary restrictions. These look great and I bet taste yummy too! It’s also nice to provide trick-or-treaters with a gluten free option, as needed. It really is nice to see so many options and they taste good too. I’m always amazed lately just by how many products are available for people with food allergies! Seem as they were all approved that obviously means they taste good too! I was pleasantly surprised with the number of options. So far, everything we’ve tried tastes good! I buy some Halloween candies for my kids Halloween trick or treat. and It’s a little bit exciting. Some of the candies I buy was Skittles, Crunch, Snickers, and Organic spooky Lollipop. Crunch & Snickers are good ones! Omg! I never knew skittles were gluten-free! Just gonna rush down to the store and buy a lot for me haha! This is such a fabulous list!! THANK YOU! I have so many GF friends and needed these tips!! I love to see companies making products that everyone can enjoy. I don’t have anyone in my family with dietary restrictions, but I have a couple of friends who do, and it can be tough to find anything during the special holidays. I do too, Stacie. It’s so helpful & helps others, especially kids, feel included. Looks like a great option for Halloween! It looks very festive and sure is a safer option. I personally will save these sweets for a treat. Thank you for the idea! Glad you found it helpful, Lyosha! I wasn’t aware of these options — I guess I should have known these choices were there! Thanks for sharing these different options. We don’t really have these kinds of dietary restrictions but it’s good to know! Mmmm candy! Delicious! 🙂 Lovely to see so many gluten free options! Thank you so much for sharing! It is yummy candy! You’re welcome, Alexandra! I hope we have such candy in our local supermarket too. Interesting to find out all the different and fun packaging for these candy. These will make the kids so happy with no doubt. All kids should be able to eat yummy candy that also fits their dietary needs! I like the fun packaging too. I really don’t know about this things but I am glad that you share this information with us. At least, now we can still give candies to our kids on this Halloween without any worries. Most people don’t think about having candy options for kids with dietary restrictions, so I wanted to share the info that I found. You’re welcome, Yasmine! It really is hard to find candy for kids with dietary restrictions. These taste good too! 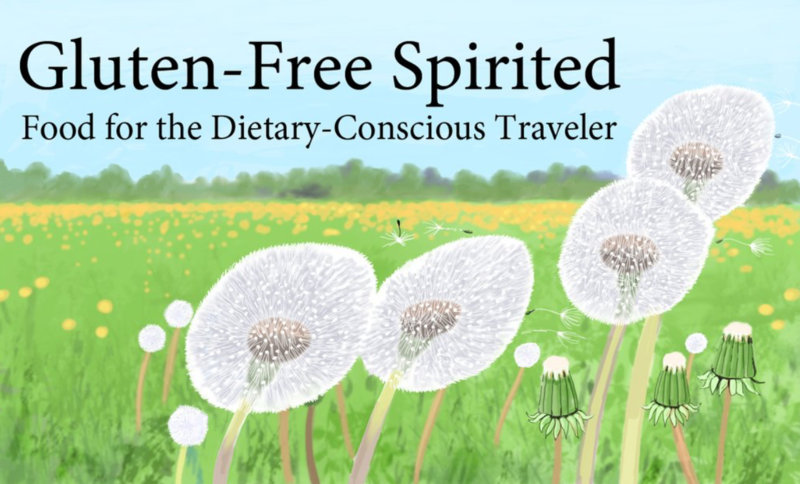 This is such a great round up for people with dietary restraints! Those Smashmellow treats are so good! It’s great to have candy for everyone! Wow! This one’s a winner. I just love everything about this! Everyone can dig right in!! I’m not allergic to anything but these treats are the bomb!!! My mouth waters just by looking at them. I still recommend them even if you don’t have dietary restrictions. I didn’t now this existed! I think it’s great that they’ve made dairy free Halloween candy. We didn’t know they existed either until we were looking for options last year. That is really great that they have options for people with dietary restrictions. These are amazing products to try. My nephew will definitely love these. There are so many delicious gluten free options for Halloween! I love the No Whey candy! Did not realize that they had gluten free candy. This is a great option for kids with dietary restrictions. It really is. It’s not something you think about until if affects you or someone you know. So good to see that they are other options out there for those with dietary restrictions. Thank you for sharing! Organic sweets! This is such a clever idea, especially for Halloween! Thanks for sharing! I am a HUGE peanut butter cup fan! I want to try these milk-free, nut-free ones. Thanks for the review! Please let me know if you try them & what the verdict is! I like that these candies are gluten free. I am sure kids love them.